On 18 and 19 April, the 24th IFHE World Convention took place in The Hague. This event was organized by the International Federation of Hospital Engineering (IFHE) and the Nederlandse Vereniging voor Technisch facilitair management in de Gezondheidszorg (NVTG, or Dutch Association for Technical Facility Management in Healthcare). The theme of the convention was: Sharing knowledge for better healthcare worldwide. Chair of the NVTG and vice president of the IFHE Douwe Kiestra opened the event in Madurodam and welcomed everyone. 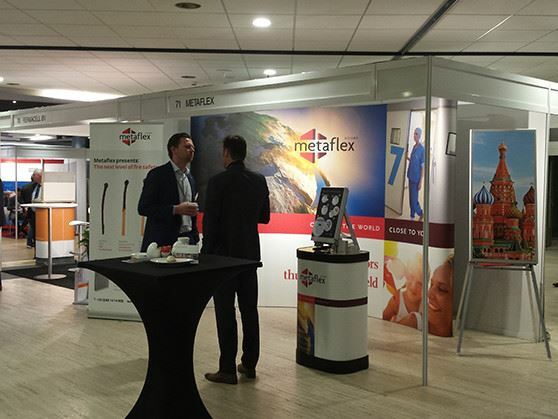 Participants in the conventions could visit the Metaflex stand in the business market on both days. Additionally, various interesting sessions were held by experts from the Netherlands, Belgium, Germany, Italy, Norway, Finland, the US, Venezuela, Chile and Japan. On Monday evening, there was a visit to the Louwman Automuseum with a party afterwards. During the convention, the first international Building Awards were presented. The winner was the Red Cross Hospital in Tokyo, Japan. The winner of the Dutch Building Award was Meander Medisch Centrum. On Tuesday, there was a lecture by director-general Bas van den Dungen, MSc, replacing Minister Schippers. This lecture acknowledged the necessity of highly trained technical employees in healthcare. The second day also had a festive conclusion, this time organized by the Institute of Hospital Engineering Australia (IHEA), organizer of the next convention in Brisbane, Australia, in 2018.